noXcape is ideal for any website that may match with your thoughts. noXcape is very powerful yet easy to use and customize, whether youâ€™re a WordPress pro or a beginner with no coding skills. Ultra Responsive noXcape will fit your large desktop screen, all the way down to your iPhone â€“ and of course any Tablet or iPad. SEO (search engine optimization): noXcape is SEO optimized and it follows the latest trends and best practices in onsite optimization. noXcape comes with unlimited color styles, custom widgets, touch & swipe enabled, Revolution Slider (worth $25), Visual Composer (worth $34), Ultimate VC Addons (worth $18) and much more. 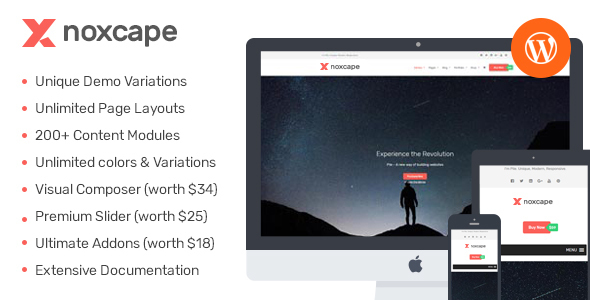 Extended Documentation â€“ noXcape is super easy to install and setup and comes with an extended documentation, ready to use page layouts and examples, HD video tutorials, PSD designs and much more. Continuous Updates â€“ I put a lot of effort into providing top-notch customer support. Buy any theme now and enjoy premium support and updates. Absolutely amazing support for this theme! Customer service should be this good on all things bought. Very much appreciate your patience and VERY quick and thorough support in helping me with this theme. Will highly recommend this product. I am new to WordPress but I have to admit that the Shuffle theme is absolutely amazing. Although Iâ€™m still learning, it is very simple to figure out and it has amazing flexibility. It is the perfect content management system for me and I am so glad I found this theme before I spent hundreds of dollars on a custom website. Two thumbs way up for the Shuffle theme and Cristianâ€™s great customer service! I am a very satisfied customer and would not hesitate to purchase another theme. I just bought your theme. Absolutely fantastic. noXcape is ready for translation. It already has the â€.potâ€ file included and ready for translation in any language. Buy noXcape â€“ Modular Multi-Purpose WordPress Theme Now! – All images used in the preview are just for demonstration purposes and not included in the Theme. They require an appropriate license to be used.